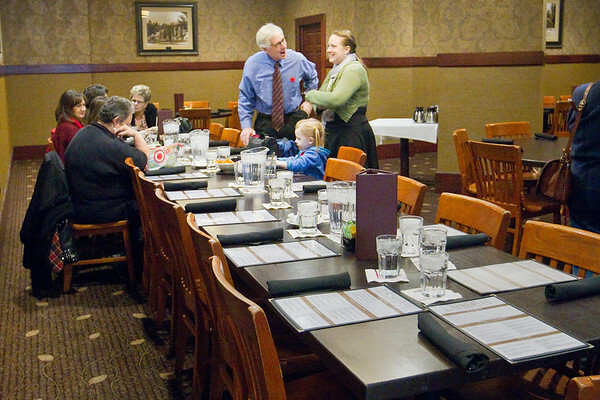 Tom Mountz, standing on the left, talks with Katie Wibby during The Veterans of the Battle of the Bulge West Michigan Chapter's annual lunch on Saturday, the 73rd anniversary of the beginning of the World War II battle in Europe. The group was made up of children, grandchildren and great grandchildren of veterans. The two surviving members of the West Michigan Chapter, Richard Rizzio and Maury Cole, were unable to attend. The group was recently notified that they may have to withdraw from the national association because their numbers aren't enough to comply with the bylaws. Mountz, chapter president, said the group, which began with 36 veterans in the mid-1990s, won't completely disband. "We will continue to meet on this day every year as friends as a tribute to those men." Mountz became a part of the group after acting as a guardian for a neighbor who was in the battle. "I loved it," said Mountz. "That was living history right in front of me at the meetings. The stories I heard from those guys... they had such a deep bond because they had those experiences together."